This brand new garden cart is constructed from Sturdy plastic for a rust proof performance. Features two, wheelbarrow, allowing you to steer the garden cart in various types of terrain The cushion-grip loop handle allows users to easily push, pull or dump the contents of the garden cart. What's still hesitating? Buy it quickly! ♠This cart is suitable for material handling applications in gardens, warehouses, construction sites and shops. ♠Our trolley is also equipped with a rubber handle that can effectively protect your hands. 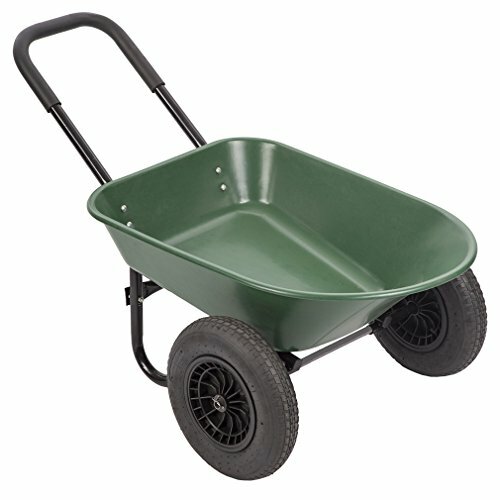 ♠The deep 5-cubic-foot construction of this wheelbarrow allows transportation of large loads of soil and other garden materials. ♠The 15 inch rubber wheels are sturdy & pneumatic, which allow you to steer the garden cart in various types of terrain. The wheelbarrow Cart is made of plastic, not iron.